The i.MX 7Dual family of processors represents our latest achievement in high-performance processing for low-power requirements with a high degree of functional integration. These processors are targeted towards the growing market of connected devices. The i.MX 7Dual family of processors features our advanced implementation of the Arm® Cortex®-A7 core, which operates at speeds of up to 1.2 GHz, as well as the Arm Cortex-M4 core. The i.MX 7Dual family supports multiple memory types including 16/32-bit DDR3L/LPDDR2/LPDDR3-1066, Quad SPI memory, NAND, eMMC, and NOR. Several high-speed connectivity connections include Gigabit Ethernet with AVB, PCIe, and USB. Both parallel and serial Display and Camera interfaces are provided, as well as a way to directly connect to the Electrophoretic Displays (EPD). 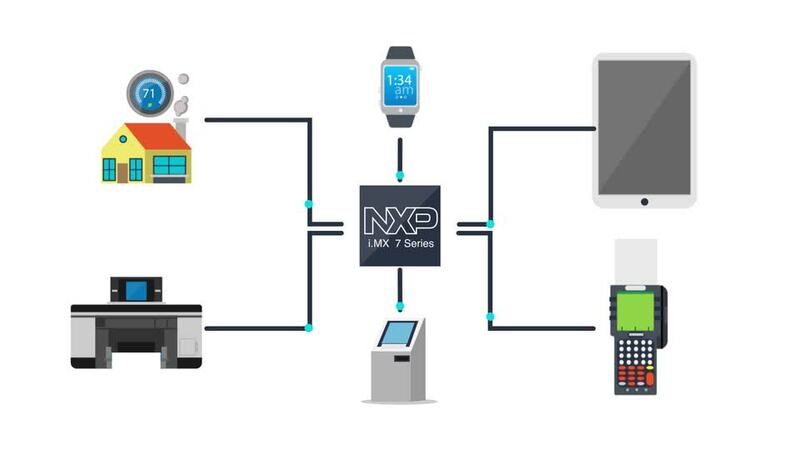 NXP delivers the Smart Application Blueprint for Rapid Engineering (SABRE) board based on i.MX7Dual applications processor, utilizing both the Arm Cortex-A7 and Cortex-M4 cores with enhanced security and power optimization.